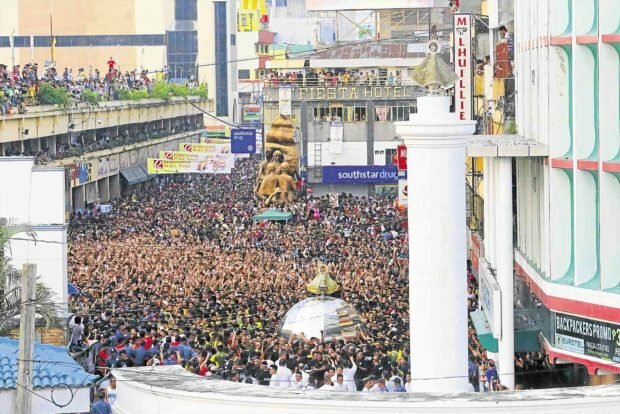 NAGA CITY — The most powerful image in the annual celebration of the feast of Our Lady of Peñafrancia could be that of streets morphing into a mass of countless human bodies moving as one in the direction of the revered image of the Virgin Mary, which has been inspiring devotion for 307 years now. Among the hundreds of thousands of people with a common objective of touching the image was Gilbert Sarmiento, 40, who sat in a wheelchair selling candles with a fellow devotee, Gloria Argente, outside Naga Metropolitan Cathedral. They were among the 1.8 to 2 million devotees awaiting the start of the fluvial procession on Saturday for “Ina,” or mother, as the Our Lady of Peñafrancia had become known among the faithful here. The procession was the culmination of a nine-day prayer for the most revered religious icon in all of Bicol. Sarmiento, a first-time pilgrim, had been in the city since Sept. 13 with other fellow Batangueños who tried to earn on the side selling candles while waiting for their turn to touch Ina’s image, which was believed to bring miracles or grant wishes. Sarmiento was born with poliomyelitis, a disease that impaired his ability to walk. He had surgery just to walk with the aid of crutches. Moving among the hundreds of thousands that filled the city streets, however, would be impossible for him. “I came here to get the chance to pray and ask Ina for good health for me and my children,” he said. Sarmiento and fellow devotee, Argente, slept on the grass and anywhere they could at night. Argente had been going on the pilgrimage for Ina for 24 years. “We sleep on the grass with only plastic sheets as mats or inside jeepneys,” she said. From Ina, she wished for two miracles — peace for her children and freedom for a son in jail. Near where Sarmiento and Argente were positioned also sat Flordeliza Asi, 68, and her grandson, Jayson De Torres, 27, also from Batangas. They listened intently to Mass being celebrated inside the cathedral and broadcast by speakers to the faithful outside. A beach umbrella covered them from intense sunlight that brought average temperatures exceeding 35 degrees Celsius. Torres has hydrocephalus. According to Asi, Torres had promised Ina to be at the procession every year for five years. This was his fifth year in the pilgrimage, according to Torres. Although doctors had told Torres the hydrocephalus could no longer be removed by surgery because he was too old for it, he had kept faith. “We are still here to pray for a cure and for Ina to guide us out of poverty,” Asi said. Fatima Asor, 12 and born with cleft palate, was a first-time pilgrim, too. She went with her grandmother, Carmen Asola. In homily during the Mass preceding the fluvial procession, Rev. Msgr. Noe P. Badiola, parish priest of Naga Metropolitan Cathedral, said absence in the Bicol region’s biggest religious celebration did not mean exclusion from blessings. He thanked the millions who filled the city’s streets to honor Ina, however. Devotion to Ina started in 1710 by Fr. Miguel Robles de Covarrubias, who introduced Ina to the natives. The image was from the mountains of Peña de Francia in Spain. The celebration starts every year with the traslacion, a procession that marks the transfer of Ina’s image from the old Peñafrancia Shrine to the cathedral where it would stay for the nine-day novena. The image is again brought to its permanent home at the Basilica Minore in a colorful fluvial procession on the Naga River as the culmination of the Peñafrancia feast. During both processions, male devotees called “voyadores” carry the image.